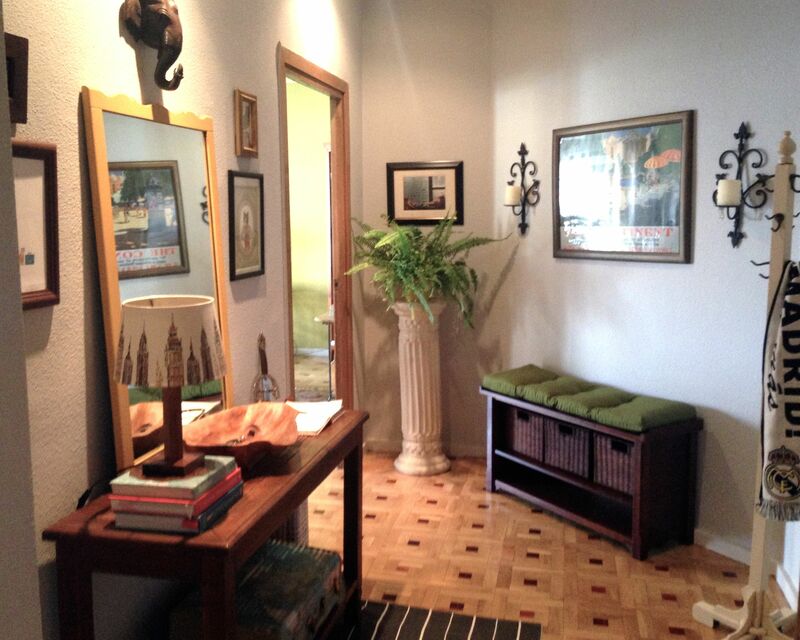 The foyer: It’s the first space that greets you and your visitors when the door opens. And it’s what your neighbors catch a glimpse of when you chase after an escaped fat cat as it jiggles down the hallway. I wanted an entryway that set the tone for the house: Comfy, stylish, and fun. But I also wanted a functional area where it’s easy to get in and of your shoes and coat, so I added a coat rack and a bench with baskets. Our entryway is a collection of fun oddities: I painted an old mirror of Mr. Dame in Spain’s mustard yellow, and that’s surrounded by an illustration of our family; an owl print; a Pewabic tile in the shape of Michigan; an illustration of a cat playing Cat’s Cradle. There’s a framed photo of our Diplocats when they lived in New York. And yet another print of an owl (I’m firmly in favor of putting a bird on it, doubly so if it’s an owl). I also used the foyer as a place to display some travel-y things, such as a vintage Samsonite suitcase; a wooden carved elephant’s head from Laos; a colorful travel poster; a sword from nearby Toledo that Mr. Dame in Spain bought in high school; and a jambiya from Yemen. We also put out a guest book that we encourage our overnight visitors to sign. We imagine we’ll cherish these notes when we’re 90 and looking back fondly to a time when paper and pens still existed. First, Before (when the apartment was inhabited by an apparent collector of crucifixes). 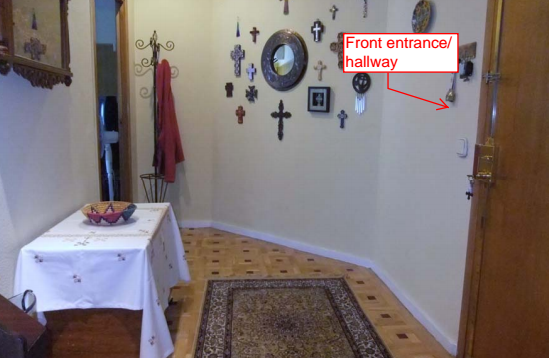 To foyers, entryways, vestibules, antechambers, etc.